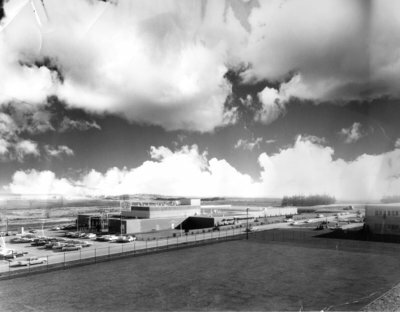 A black and white photograph of the DuPont Plant in Whitby. The DuPont Plant in Whitby was built in 1958/59 and several additions have been made to it. The plant manufactures polyethylene film. Located at 201 South Blair Street. DuPont Plant Whitby, c. 1967, Denis Mickler Photography. Whitby Archives 15-017-003.